Extract from poster: "Plan of the lower deck with the stowage of 292 slaves. 130 of these being stowed under the shelves as shewn in ­­figure D & figure 3. 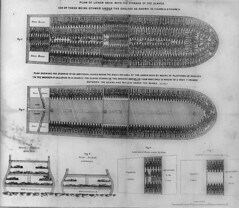 "Plan shewing stowage of 130 additional slaves around the wings or sides of the lower deck by means of platforms or shelves (in the manner of galleries in a church) the slaves stowed on the shelves and below them have only a height of 2 feet 7 inches between the beams and far less under the beams."